We are an operation compartment for surface finishing focused on anodizing. Our services include coating of aluminum castings and aluminum 99.9% plus all common aluminum alloys used in industrial and medical applications. 1. Depending on the alloy, the oxide layers generated in alloy typical color casts. 2.When machine parts created of different aluminum alloys colordifferences may happen. We operate one of the most modern rectifier systems in our house. The anodising is automatically performed and stopped when the preset thickness is reached. Aluminum objects cannot be oxidized chemically or anodically easily. Dirt, oil, grease, coolants and abrasives as well as roll, pressing, blooming and cast skins need to be removed in the chemical pretreatment. A clean surface is mandatory for a uniform oxide layer. Not all listed methods are possible in architecture and / or industry. In this first wet chemical level in all chemical or electrochemical treatments all traces of organic substances are removed thoroughly. The parts are treated in alkaline aqueous cleaning baths. Grease and oils are emulsified, other fouling are replaced and dispersed. Note: Silicone oils, silicone-containing release agent or dried, not emulsifiable operating materials may require additional effort (eg. Use of solvents or abrasive degreasing by hand). After degreasing the aluminum parts are normally stained. This is done in an alkaline pickling bath (chromic acid anodization = acidic pickling baths), which removes the last traces of grease, dirt and natural oxide layer. Note: Complete removal of the oxide layer is essential for the uniform layer structure in the following oxidation. Fully machined, precision components pickling is reduced to a minimum or even omitted for reasons of dimensional stability. A precondition in these cases is a clean delivery of the parts without adherent dirt. Only this way the proper structure of the layers can be guaranteed. For reflectors, fittings, ornaments and selected equippment components of aluminum often a maximum gloss and reflectivity is desired. A maximum of gloss and reflectivity is often desired when it comes to reflectors, fittings, ornaments and selected equippment components of aluminum. Mechanically mirror finished aluminum surfaces have a reflectance of only 70 percent. To protect and preserve the gloss an anodic oxide film is necessary, but it also reduces the reflectivity by another 5 to 15 percent. Chemical brightening and a subsequent oxidation shield increases the reflectivity up to 80 percent. By chemical removal of 5-10 microns the aluminum gets smoothed, so it obtains a shiny surface. Note: High gloss levels can only be achieved using pure (99.8%) and purest (99.9%) aluminum. Grinding and polishing followed by chemical or electrochemical brightening results in a high-gloss appearance. 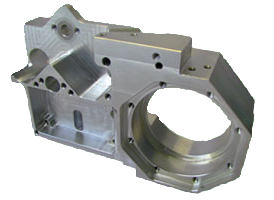 Mechanical surface defects and incipient corrosion are in general eliminated. * The terms E0 to E8 refer to the standard DIN 17611/17612. A suitable blasting agent (corundum, aluminum granules, glass beads etc.) is thrown onto the metal surface by compressed air. The workpiece’s surface is cleaned, deburred and can even be decorative refined. The effect of blasting can hereby be controlled by choosing a proper abrasive. The anodization of aluminum – also called anodic oxidation – is a proven and common for surface finishing of aluminum. The aluminum surface is changed into aluminum oxide in an electrochemical process. The oxide layer is ceramic hard, transparent, and, in contrast to other finishing processes, firmly connected to the base material. The film thickness can be selected depending on the intended use of the workpiece. Anodizing is applied to preserve the valuable metallic character of aluminum in architecture (eg. facades) and indurstry (eg. medical, aerospace, machinery industry). According to costumer request all generated layers can be colored. It is black, natural bright/lucid and chemically shiny bright/lucid or black. Other colors can be made feasible by request and special agreement. Different specialized anodising allows us to go into your specific application area or the required layer properties. The common DC anodizing (DC / sulfuric acid method) is in the foreground. Anodic oxide layers are compacted at the end of the process and creates a sealed homogeneous oxide layer. This procedure is essential for the quality of the oxide layer. This link includes a table that contains the entire alloys and its capability of anodising. It would be great if you make use of that table when you are requesting.